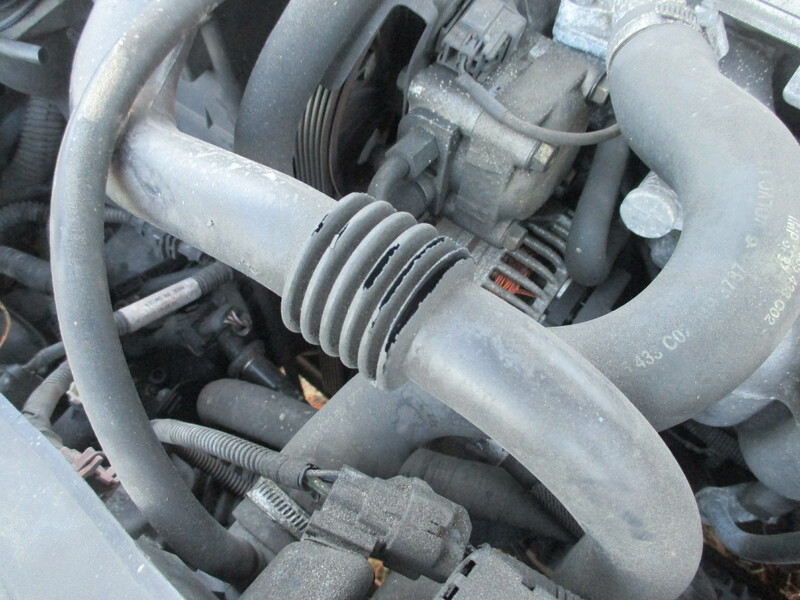 I bought the car less than a week ago, but I noticed this hose was damaged. I want to know what it is so I can get it replaced. There is another hose from the heater to the power train computers, and air pumps through that to keep the computers dry and at some reasonable temperature. That hose pictured is actually the outlet I think. I have never actually had to make sure. If you look at where it goes you would probably think it's the inlet but I don't think so. Think of it for a duct for the heater. Duct tape would serve just fine, but if you can find a good one that would be good too. They used the same hose on the 850's. Thanks. I will try use duct tape to patch the holes. Duct tape will look horrible! I don't wish to argue but as I recall, the function is to force cool air IN, not warm air in. Go to an Ace Hardware, they have assorted tubings for RV's. There is one that will fit perfectly when you buy 6-12 inches and trim of both sides of your defective piece. Sometimes it is black, sometimes white. Both look good. So if I show them the picture of the hose, they will be able to sell me a hose capable of replacing it? And once I obtain the hose, what is the procedure for fixing it? Would I cut off the damaged section of the hose in the car, then fit the new hose into the massive gap that was just formed, and then seal it up? Please correct me if I'm wrong. I am, how shall I say this, naïve when it comes to repairs. Cut off about 2 inches each side of accordian area. measure outside diameter. Get the hose whose inside diameter matches your outside diameter. Just take what you cut off down their and you'll see what you need or a clerk can help you. I used black zip ties to hold the tubing in place. Oxygen Sensor damaged from shipment? Value of previously damaged S60?